I have been doing the same for several years now. But I do ask the bank to list both my fixed deposit (800K) and my savings account balances on the letter and provide copies of the pages of both as they do like to see some activity on the accounts. Never had a problem. I think if you are just using a Savings Account they like to see transactions, but I've never been asked to show any transactions of any kind (other than the recent update) when using a Fixed Term. But again, different offices have different rules. Even different IOs in the same office can have different interpretations of the rules and those can change depending on what kind of day they are having (or the person they are having to deal with). Sorry for these very basic questions, but I have never had a fixed deposit account here in Thailand - but now find it interesting to have one for my retirement extension. For a fixed deposit - what do you bring to Immigration as proof? I mean there are no or very few movements (interest being added) on the account - so how to show an updated account? There is a passbook and if you stick it in the machine after a spell there is a line with current date and balance printed. Immigration are familiar with them and the bank will issue a letter which seems to cover requirements. Actually, not having transactions means there is rarely a consolidated entry , and rarer mid-term new passbook transfer. Immigration expects a very recent update of the bank book (same day, day before,...) and a corresponding letter. 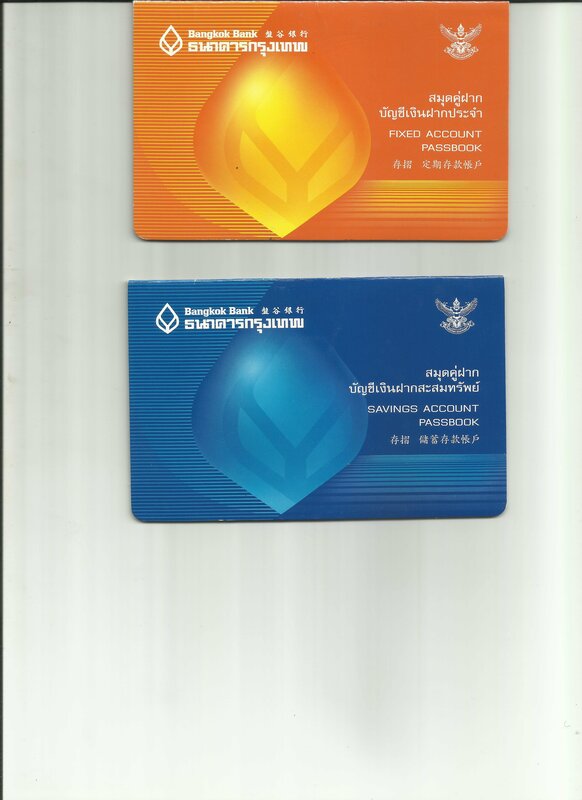 Bangkok Bank can do an update without having transactions and supply the letter for this balance. SCB is not able to do an update without transaction. For this you should deposit(!) a small amount like 1000 Baht at the counter and then request update and bank letter. I am quite certain that IO officers know well about the types of account (availability). When you open a Fixed Term account, they give you a bank book (but not an ATM card). Some may call it a "pass book". It shows the amount deposited and the date. The day before I go for my extension I go to a bank branch and "update" the book, then photocopy the page that shows balance and new date. OK, thanks. Not sure if Krungsri have the same system. But also not sure how you can update a fixed deposit passbook, as it's "fixed"; suppose it depends on the narrative in the passbook, which one hopes the IO at CW would accept. bangkok bank can update the FD books with current balance. i usually get a balance 3-1/2 months before, 1 month before, and morning of application when i get the bank letter. all show the same amount (if no interest added), accepted at CW. the passbook update machines will do this, but i prefer to go to the counter (any mall bank while shopping...). if the machine print is illegible or overwritten, i want the clerk/manager to correct it while i'm there. Check carefully if you use CW as there have been reports in recent threads they won't accept fixed deposit accounts. I was able to confirm with Prachinburi Imm today that they are fine with fixed deposits. In fact the head lady seemed positively happy with the idea. I had to ask 4 different IOs and ultimately get referred to their senior officer to get this answer though. I am certain it would not be accepted by immigration since the rules state a Thai bank. I suspect also that it is would not meet the requirement that the money has to be available for immediate withdrawal without a penalty. I’ve looked through this whole thread as well as others but can’t see definitively If Chiang Mai accepts fixed deposits. Does anyone know for sure? Proof for Immigration, letter from bank stating how much and how long it's in the bank ,update you're fixed deposit book same time that shows the money still being in there ,can do both (down where we are ) 1/2 days before applying for extension, next time just roll it over and do same with the update and if you do the added interest and update the bank book. What happens if you open a fixed deposit account with money taken from your savings account? How does the money show regarding source, as I believe it has to show as coming from outside the country! How does the money show regarding source, as I believe it has to show as coming from outside the country! That is not required for an extension application.